Whenever I'm hitting the road, I always struggle with what to do with my Apple Watch. I need a charging puck to bring with me but the original one that shipped with my watch is far too long or already encased in a dock. I've looked at many third-party alternatives which offer shorter lengths for less than Apple and even the new USB-C version Apple dropped. None of these really fit the bill for what I was looking for. They all came with their own compromises. I've been bringing OPSO's new Apple Watch battery pack with me for all my recent travels and think I've finally landed on the first Apple Watch charger for on the go that don't also have a series of compromises. 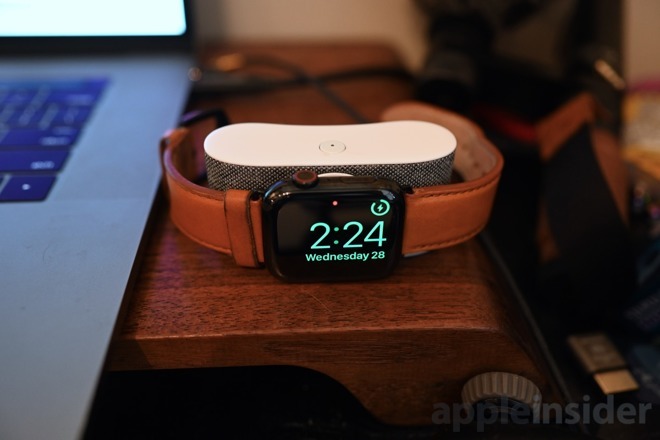 The OPSO battery pack is a small palm-sized device that stores a 2100mAh battery behind a standard Apple Watch charging puck. That is enough for roughly four full days of Apple Watch use. 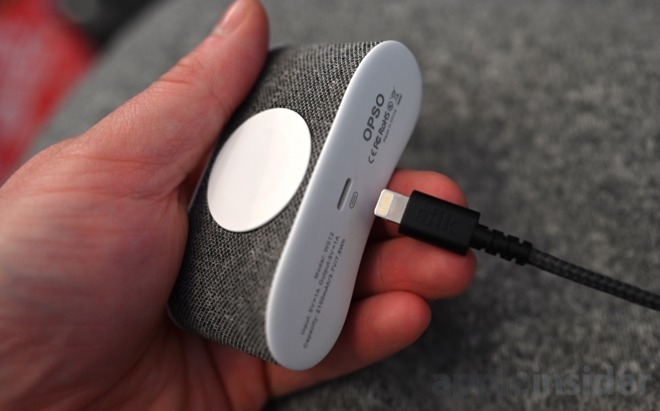 To power up OPSO, there is a Lightning port which makes a world of difference. If you are on the road for more than four days and find yourself needing to charge OPSO, you simply use the same cable you use for your iPhone. That's one less cable needed when space can be a commodity. 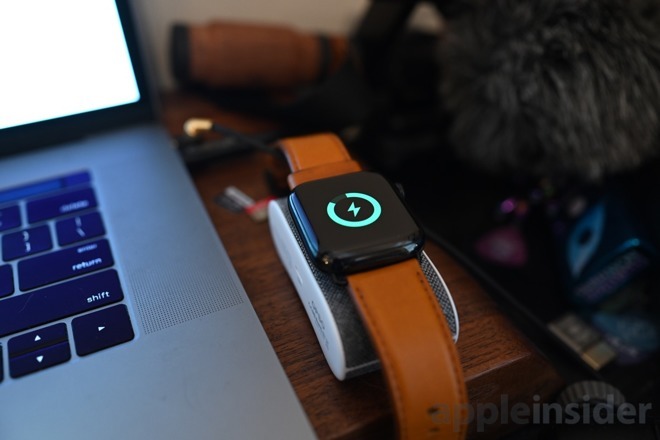 There are a host of uncertified Apple Watch adapters, and we don't recommend any of them. 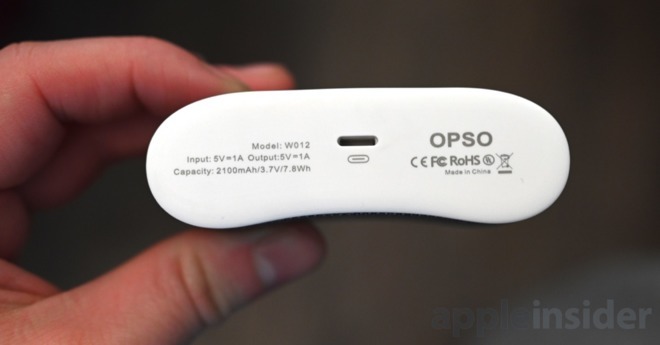 The OPSO is a happy exception —Apple has certified the device though their Made for Apple Watch program, including the Lightning port. That guarantees compatibility and reliable charging. The body of OPSO is covered in one of two materials — leather or fabric. We tried out the fabric model and appreciated the soft material wrapping the enclosure. If you've tried the Mophie USB-C powerstations, it isn't too dissimilar to that fabric which has received rave remarks. Because of that detail, We felt more comfortable with our band resting against that rather than an unadorned metal or plastic case. OPSO has a bean-shaped curve to it that is comfortable in the hand while holding it, as well as makes it easier to clasp a band around the device. Looking back at my original complaints about Apple Watch portable charging, OPSO addresses all our concerns. There is no permanently attached cable, but when it does need to be plugged in it uses a cable you already have. It is small and portable, well-built, and Apple certified. And most of all, it lets us go away from the home base for days at a time without having to worry about charging my Apple Watch. OPSO is available to order now on Kickstarter with shipments scheduled to commence shipping in January for $39 — a slight premium over a standalone Apple Watch charging puck. Remember, this is a Kickstarter and your backing OPSO helps them come to market and isn't a guarantee that the product will succeed. However, as we've already tested the viability of the product, it is certified through Apple, and OPSO has been putting out products for years, we are very confident it will be delivered to customers.